Ethanol is produced from high starch feed wheat, both spring and winter varieties. Farmers deliver these grain to the feed mill where it is first screened to remove large material and then elevated into three storage bins. The grain is transferred into the ethanol plant and passes over a weight belt. The grain then drops into a hammer-mill and is milled into smaller particles so more surface area is exposed to the water and enzymes. The milled grain is now mixed with hot water in a mash mix tank where enzymes are added to help control viscosity. The mash is then pumped into a continuous jet cooker where the temperature is increased by the addition of high temperature steam. The mash is cooked to sterilize the grain and hydrolyze the starch into fermentable sugars. The mash then goes into a liquefaction tank where more enzymes are added to complete the conversion of starch into sugar. It is then pumped through mash coolers where the temperature is reduced before fermentation. Enzymes are added (alpha-amylase) to convert short chain starch into sugars. With the help of yeast, the sugars are then converted to ethanol and carbon dioxide. There are 4 fermenter tanks in the plant each holding 283,000 litres of product. It takes approximately 20 hours to fill one fermenter and an additional 48 hours to complete fermentation. While one fermenter tank is filling the other three fermenters are in various stages of fermentation. Yeast is added to the mash along with enzymes. The fermenters are constantly circulated and cooled through a plate exchanger to maintain a constant temperature. The yeast is using the sugar to reproduce and this results in the production of carbon dioxide and alcohol. It is very important to have good sanitation in the fermenter to reduce the growth of bacteria. The fermenters get cleaned with hot liquid caustic after each batch which kills any organic matter that may be present. When all of the sugar is consumed the product is now called beer because of its chemical properties. At this time, the product is 10% to 12% alcohol per volume. The contents of the fermenter are now transferred into a beerwell. The beer is pumped into a distillation column where the alcohol is boiled off. The ethanol evaporates to the top of the column and the grain and water fall to the bottom. The ethanol that is at the top of the column is 94% alcohol. The ethanol is purified further by removing the last 6% of water. It is dehydrated by a molecular sieve which purifies the ethanol to 99.5% alcohol. The molecular sieve consists of four vessels containing desiccant which is a bead like material. The beads will allow ethanol to pass around them and the water is absorbed into the beads. A vacuum pump regenerates the saturated beds every few minutes which means the water that has been collected is removed and recycled. Before the ethanol leaves the plant, it is denatured with gasoline to ensure that it does not go into the potable market. The final product is transferred into two large storage tanks each with a capacity of holding 500,000 litres. Tanker trucks pick up the ethanol and take it to a blending station where it is blended with gasoline up to 10% ethanol. The plant produces two co-products, WDG and thin stillage, which are fully utilized in the feedlot. The grain and water that falls to the bottom of the distillation column is called whole stillage. The whole stillage is passed over vibrating screens to separate the suspended solids from the liquid. The solid fraction is then pressed (by a screw press) for further removal of water and solubles. The liquid thin stillage is stored in a large holding tank. The thin stillage contains about 9% dissolved solids which is mostly made up of protein. It is then pumped to the water bowls in the feedlot. 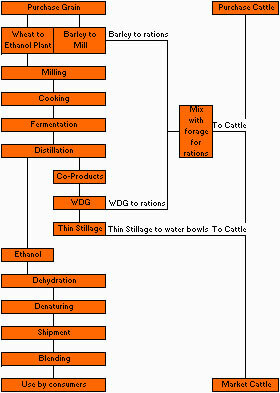 The second by-product produced is wet distillers grains (WDG). All the starch in the grain is used up in the fermentation process to produce ethanol. What is remaining is a concentrated form of protein. The WDG produced is very moist - between 75 and 78% moisture. Because of this moisture the WDG needs to be used within a few days. About 110 metric tonne of wheat is milled each day in the plant producing 40,000 litres of ethanol. One bushel of wheat will yield about 10 litres of ethanol. The ethanol plant draws its water from 2 deep wells (300 feet) and uses over 400,000 litres per day. The high pressure boiler needs very pure water and this is achieved by an Industrial Reverse Osmosis unit which purifies the make up water. Produced from renewable resources such a grain and other plant matter. Because ethanol contains oxygen, combustion in the engines is more complete. This results in a substantial reduction in carbon monoxide emissions into the atmosphere. Carbon dioxide is released into the atmosphere when ethanol is burned. Carbon dioxide is easily reabsorbed by growing plants. This completes the natural carbon cycle and helps to reduce the greenhouse effect.